World Vasectomy Day makes history this week with a 24-hour 'vasectomy-athon' and a major public event in Mexico City featuring live vasectomies, discussion panels, a lucha libre fight and concerts. With 1,200 providers in 50+ countries, this will be the largest male-oriented family planning event ever. 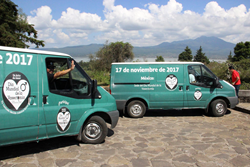 In the midst of political tension, a year of striking sexual abuse revelations in male-dominated industries and a catastrophic natural disaster, the fifth anniversary of World Vasectomy Day - the largest male-focused family planning event in history - will redefine responsible masculinity from its headquarters in Mexico City.